Showing results for tags 'devil may cry'. What is the best Devil May Cry game? I just happened to find this on google images. It was uploaded to Deviantart.com by someone named "Atrafox". 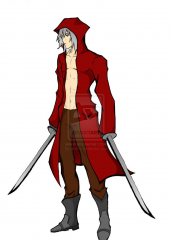 It was actually an OC named "Crisius", but all I saw was a rippoff of Dante from Capom's Devil May Cry series. I don't own the picture, repeat, it belongs to Atrafox. So I came up with an idea while playing DmC and talking to a friend on Xbox Live about our Minecraft worlds today and thought of something. They've been doing the whole Mashup Pack thing a lot. It's DLC that gives you a new Texture Pack, Skin Pack, World and BGM/Sounds. My original idea was a KH and DmC Mashup Pack for Xbox and PS3. I actually had some ideas that would work too. Like for the DmC Mashup would have Dante, Nero, Vergil, Trish, Kat, Lady and DmC Mundus as skins at least, the world would incorperate some of the various DmC locations (Like they did with the Halo and Skyrim Mashups). As for items, I figure the Swords could go as follows: Wooden Swords are Force Edge, Stone would be Alistair, Iron would be Red Queen, Diamond would be Rebellion and Gold would be Sparda or Yamato. For the KH it would be sort of the same, with the skins being Sora, Kairi, Namine, Roxas, Aqua, Ven, Terra, Goofy, Donald, Micky, Xion, Vanitas, Eraqus, Xeanort(Multiple forms) Lea, <aleficent, Braig, Orginzation XIII, Shadow, Dusk and Riku. The swords would progress as: Wooden Sword=Wooden Sword, Stone Sword=Kingdom Key, Iron Sword=Kairi's Keyblade, Diamond Sword= Way to Dawn and Gold Sword= Kingdom Key D. I also thought SAO could work, with similar styles. Skins: Kirito, Asuna, Leafa, Yui(All forms), Heathcliff, Silica, Lisbeth, Sachi, Suguha, Oberon, Recon, Eugene, and Sinon Weapon Tiers as follows: Wooden Sword=«Anneal Blade, Stone Sword= Lambent Light, Iron Sword= Elucidator, Diamond Sword= Dark Repulser, Gold Sword= Wind Fleuret. Those were my ideas, my little brother thought of Mario and my sister thought of Power Rangers. Looking for opinions here, and ideas for other Mashups people might like. I don't really care about DmC but that ending got me!